Together with the city of Rotterdam, the service design agency Muzus won the award for organisational impact in the public sector. The city of Rotterdam is offering a mobility service to people with special needs to make sure they get to where they want. They realised, however, they did not know the people they were offering the service to. 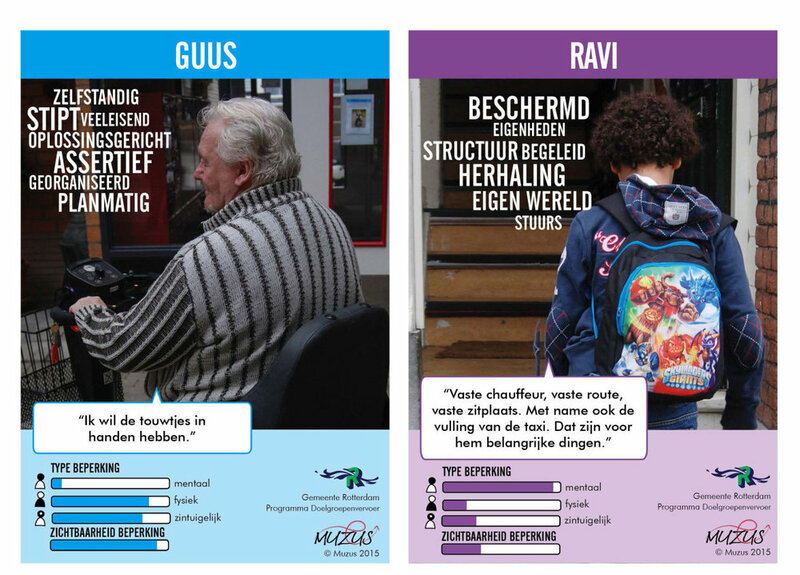 Muzus conducted qualitative research in various ways to give the city of Rotterdam insights in these users. These insights were used in various ways to offer the best service possible. Together with the city of Rotterdam Muzus worked on the tendering process for finding the best transportation companies. They conducted user research to learn about the users that where making use of the transportation the city was offering. They concluded their insights in personas and journeys and used these to brief the potential transportation companies. These companies that wanted to apply for the job had to show how they would take care of these user needs. We found truly inspiring how the knowledge of the users was used in the tendering process. This all to make sure that the user needs where met by al parties involved in the service. Often when creating personas we get into a discussion (with ourselves or our clients) on which pictures to use. We cannot use the pictures of the actual participants of the user research due to privacy reasons. We also don’t want to use stock photos that don’t look like real people. The solution is not the use of an icon because then you make the persona very impersonal. We noticed that Muzus used pictures that are taken from the back. We think this is a very clever way of still making it personal but not putting one face on it that might limit the persona too much. Great job! When we asked Neele to record the podcast interview she told us we could not communicate too much about their project yet because they were still in the middle of the tendering process with the transportation companies. Therefore we had to schedule the interview a couple of months later. But luckily this made our interview only more interesting! Oh and by the way, if you want to learn more about Muzus, we already did an interview with Neele’s sister Sanne a year ago. Check out the episode here.